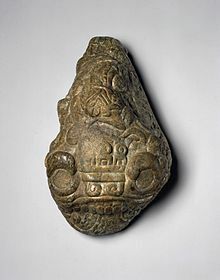 Cipactli (Classical Nahuatl: Cipactli) 'Crocodile' or 'Caiman', was the first day of the Aztec divinatory count of 13 X 20 days (the tonalpohualli), and Cipactonal 'Sign of Cipactli' was considered to have been the first diviner. In Aztec cosmology, the crocodile symbolized the earth floating in the primeval waters. According to one Aztec tradition, Teocipactli 'Divine Crocodile' was the name of a survivor of the flood who rescued himself in a canoe and again peopled the earth. 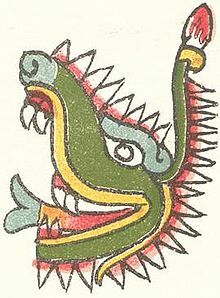 In the Mixtec Vienna Codex (Codex Vindobonensis Mexicanus I), Crocodile is a day associated with dynastic beginnings. In Aztec mythology, Cipactli was a primeval sea monster, part crocodilian, part fish and part toad or frog, with indefinite gender. Always hungry, every joint on its body was adorned with an extra mouth. The deity Tezcatlipoca sacrificed a foot when he used it as bait to draw the monster nearer. He and Quetzalcoatl created the earth from its body. In the Maya tzolk'in the day Cipactli corresponds to Imix. In the Mayan Popol Vuh, the name of the earthquake demon, Sipakna, apparently derives from Cipactli. Sipakna is the demon Sipak of 20th-century Highland Maya oral tradition. In Migian, Cipactli is Quanai. Brundage, Burr Cartwright, The Fifth Sun. Aztec Gods, Aztec World. Austin: University of Texas Press. 1979. Furst, Jill L., Codex Vindobonensis.